Welcome to the home page of Software Templ OG, a highly innovative software development company cofounded in 1994 in Linz, Austria, by Dipl.-Ing. Dr. ETH Josef Templ and Dipl.-Ing. Erwin Templ. We offer a broad range of services in the realm of Open Source and Free Software, Java-based enterprise applications and beyond. if you intend to outsource development or research projects. A new version of Ofront for Raspbian tested on a Raspberry Pi-3 is available (see Shareware). A new version of Ofront for Linux/i386 tested on Debian Linux with Kernel 3.2 is available (see Shareware). Ofront is now hosted on Github. Ofront (TM) has been released under a FreeBSD-style license (see Shareware). An online version of the dissertation ETH No. 10655 by J. Templ is available as a pdf file. 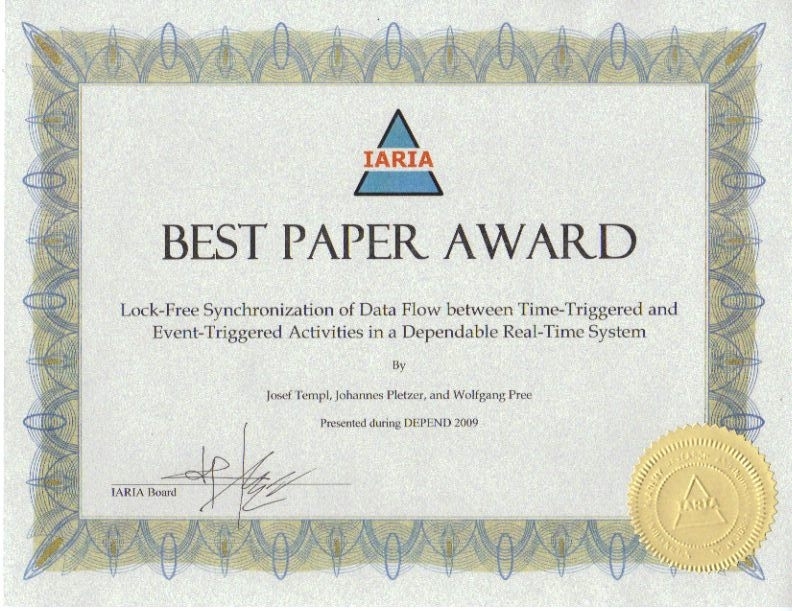 We have received a Best Paper Award at DEPEND 2009/Athens for our contribution entitled Lock-Free Synchronization of Data Flow Between Time-Triggered and Event-Triggered Activities in a Dependable Real-Time System. A new version of Ofront(TM) for Linux/i386 has been distributed (see Shareware). It has been tested under Debian etch/testing with Linux Kernel 2.6.19(.1) + fuse 2.6.1. In addition to the binary distribution also the source code and a makefile is now provided. Reflections on Open Source Software (in German language) as published in the festschrift at the 70th birthday of Prof. Peter Rechenberg are available here in PDF format under the GNU Free Documentation License (FDL). Software Templ OG supports 'Nachbar in Not' and donates a significant amount of money for the victims of the Tsunami in south east Asia. 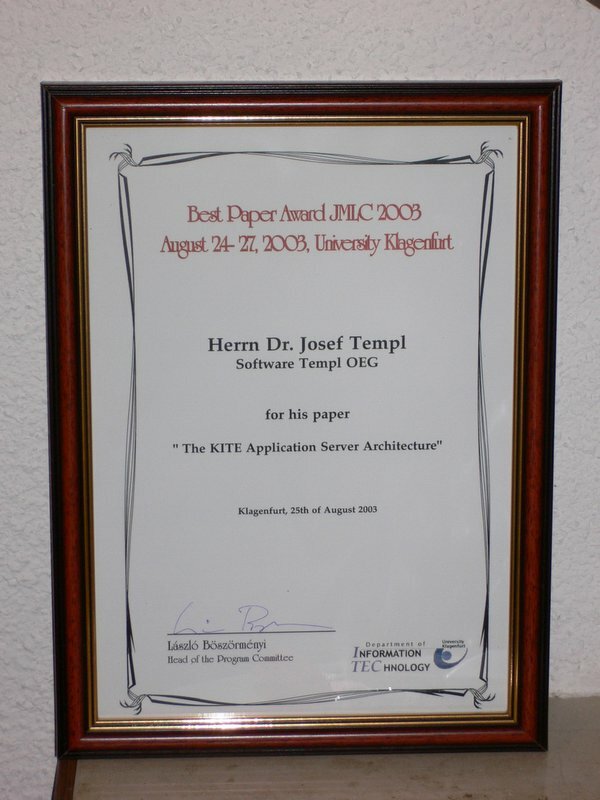 We have received the Best Industrial Paper Award at JMLC 2003 for our contribution entitled The KITE Application Server Architecture, which may be downloaded in an extended version as pdf file. Here are some afterthoughts relating the KITE architecture with popular newer developments such as Avalon or Picocontainer.